Most corporate offices look like they could be plopped into any metropolitan area, but step inside PWC’s new Austin headquarters and it’s obvious you’re in the Texas capital. The veins of a city-street map are painted on a wall mural, drumsticks and guitars adorn meeting room surfaces and a readerboard inspired by the often-quoted El Arroyo’s restaurant parking lot sign greets visitors at the entrance. 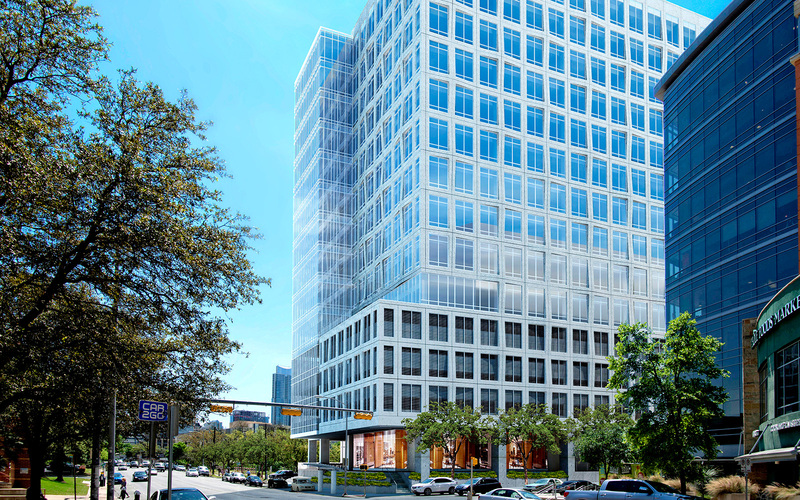 For the financial heavyweight’s new digs inside Shoal Creek Walk on West Sixth Street, PricewaterhouseCoopers LLP wanted its expanded space to have a distinctive Austin-centric design and plenty of communal, open space for its 250 Austin employees. Click through the slideshow to get a peek inside. PWC started operating out of its new office last week after construction crews put the finishes on the 23,781 square foot space on the 16th floor and part of the 15th floor. Previously PWC leased about 13,000 square feet spread across two locations: one on North Lamar (in a building where the movie “Dazed and Confused” was filmed) and one in the Comerica Bank building on Sixth Street (where Facebook resides downtown). Schlosser Development’s 220,000-square foot building opened last fall with the audio tech company Cirrus Logic Inc. as the primary tenant. Recently Central National Bank signed a ground-floor lease inside the building, said Daniel Morton, the leasing agent on Shoal Creek Walk. Other tenants include Vida Capital, Ovation Partners, Virtus Real Estate and the Law Office of David Goodman. Cirrus Logic has room to expand, Morton said, and there is still about a 3,200-square foot restaurant space available. Elsewhere on West Sixth Street, Schlosser Development is also buying the Austin Independent School District’s building, the Carruth Administration Center, for $36.5 million. Schlosser wants to redevelop the Carruth property but doesn’t have plans pinned down yet, Morton said. To learn more about Shoal Creek Walk click here.